In the TD10 level a big diversity of fauna has appeared of both herbivores and carnivores, as well as a huge collection of Acheulean tools dated between 350-450 ka. The bones are broken into many pieces, showing intentional fracturing, cuts and hammer marks. The hominins brought different types of carefully selected stones and developed a standardised knapping system to produce flakes, which were often retouched afterwards. TD10 is a significant level to show different modalities of human occupation (bison processing site, central camp) and to define models for the predator activity and the coexistence with hominin. In particular, TD10.4 has yielded in 2017 a beautiful quartzite Acheulean handaxe (420-430 ka). SH is the famous site with 7,000 fossils of 28 individuals representing more than 80% of the total fossil record of the Middle Pleistocene. Some fossils from this site have also provided the oldest human DNA recovered so far. Their genome shows a clear link between this population and the neandertal lineage. A new area of the Sima was excavated in 2017. The result is again impressive, with 20 new human fossils including fragments of tibia, hand, feet, vertebrae and crania. The size of the SH fossil record may potentially increase in the next years thanks to this new area. A mandible appeared in the last day of the campaign, which may correspond to Cranium 15 (pending to study… Cranium 15 individual could be younger than the mandible). This was a natural trap where many animals fell down and their bones were processed by humans. The occupation of the site was not permanent, but rather from time to time to enter and scavenge. Abundant Acheulean tools and many equid and cervid bones have appeared, including mandibles, teeth, skulls, vertebrae and ribs. In 2017 Unit GIIIa (270 ka) was excavated producing more fauna bones and tools. This evidence reinforces the repetitive use of the cave by humans to get the legs of the animals with the richest meat assemblages. The most exciting news in 2016 came from a new site, Cueva Fantasma, a huge site of 30 m wide and 10-13 m of sediment. In 2017 they have cleared 10 to 12 Tm of rock from an old quarry. The lower sediment levels may correspond to 1,5-2 Ma. The finding of fauna remains and Mousterian tools estimated at 120-70 ka suggests the presence of ‘classic neandertals’ in Atapuerca (pending final dating). In 2016 a fragment of human parietal bone had also appeared which could be of a neandertal. Remains of equid and cervid were recovered from two sectors corresponding to the neandertal occupation of the Atapuerca sites, together with Mousterian tools. Some of the bones show cut marks. In addition, carnivore bones appeared (hyena, wolf). This site is dated up to 60 ka. Around the Trinchera complex there are other 30 open sites with neandertal evidence. Fuente Mudarra has been excavated since 2012 and this year it has yielded a rich Mousterian assemblage. This site was a workshop that the neandertals used for a massive meat processing activity. Modern humans used this cave during the Neolithic to keep animals during pregnancy and lactation (mainly caprid). Another level dated to late Neolithic or Calcolithic has yielded evidences of cannibalism. This is the main entrance to Cueva Mayor. It shows a complete record of human presence between the Neolithic (7000 BP) and the Bronze Age (3000 BP), until the 13th century. Hundreds of objects have been found there: pottery fragments, arrowheads, buttons, necklace beads, burins, spatulas. In 2017 two new objects are remarkable: a perforated button and a gold pin finished in two spirals. 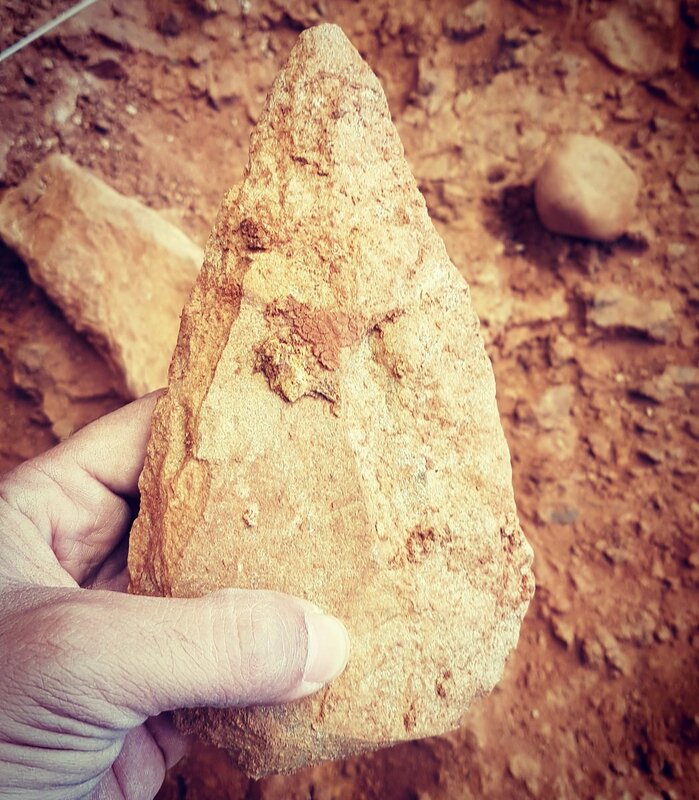 Esta entrada fue publicada en Actualidad y etiquetada Atapuerca, Fósiles, Pleistoceno Medio. Guarda el enlace permanente. Eccezionale. Un complesso archeologico di inestimabile valore. Una vera fortuna. Quanti archeologi sono necessari per studiare tutto questo?